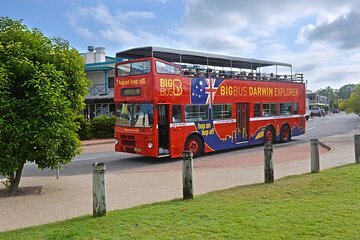 Byt dit krydstogtskib til en hop-on hop-off bustur i Darwin på denne sightseeing shore udflugt. Vælg et 24- eller 48-timers pas og udforske byen i Top End i dit eget tempo. Bestyr den åbne dobbeltdækkerbus fra krydstogterminalen ved Fort Hill Wharf og afstig på nogen af ​​de 11 stopper rundt om Darwin, eller hold simpelthen på bussen for en 60- eller 90-minutters fortalt tur. Besøg Militærmuseet, Botaniske Have, Læger Gully, Crocosaurus Cove og meget mere! Denne bustur forlader lige uden for krydstogterminalen og har 11 stop rundt om Darwin. Når dit skib trækker i havn i Darwin, skal du designe din egen sightseeingtur på en udflugt. Bestyr din open-top dobbeltdækkerbus på Fort Hill Wharf, bekvemt placeret udenfor krydstogterminalen. Busser afgår hvert 30. minut for 1-timers morgenrute med 11 stop, og hvert 45 minutter for den 1,5-timers eftermiddagsrute, som omfatter East Point Reserve og et ekstra stop på Military Museum. Lyt til underholdende kommentare for hele ruten, eller hop at bruge så længe du kan lide på forskellige seværdigheder omkring Darwin. Vælg en 24- eller 48-timers pas og se Darwin Waterfront Precinct, Crocosaurus Cove, Læger Gully, Cullen Bay og Marina Military Museum. Se rejseplanen for en komplet liste over hop-on hop-off busstoppesteder. Denne udflugt ligger inden for 5 minutters gang til krydstogtsporten, så du bestemmer den tid, du vender tilbage til dit skib i Darwin. Giv dig god tid til at nyde udflugten og sørge for din rettidig tilbagevenden til havnen. Denne udflugt er ikke dækket af vores bekymringsfri politik. I bought the tickets online before we arrived in Darwin. It would have been nice to know that everything in the city was closed for New Years Day when I purchased the tickets. There was no reason to take the bus. Highly recommend it the driver was very friendly and helpful. The bus was just next to the ship terminal and made it easy to find. It was a very hot day so seen the tour was a great option. And been able to hop on hop off was ideal. This is a nice way to see Darwin and environs in 1 day, unfortunately, there just isn't a lot in Darwin to 'hop off' and see! We we in Darwin for a day on a cruise. It's an easy to walk from the cruise port to the city center, where the bus starts - just walk along the breakwater, across the man-made lagoon, up the glass elevator, and you're practically there. The morning busses 9a, 10a, and 11a do a 60 minute loop, but the only stop worth 'hopping off' is at the Museum and Art Gallery of the Northern Territory. The afternoon busses 12p, 1:30p, and 3p do a 90 minute loop that include the East Point Military Museum. The best strategy for a 1 day visit would be to start with the 10a loop, 'hopping off' at the museum for an hour, and returning to town on the the 11a bus. Then, taking the 12p bus out to the military museum, returning on the 1:30p bus. Good tour, but the cruise terminal stop was very busy and had to wait in the heat. Da wir mit dem Kreuzfahrtschiff Celebretiy Solstice in Darwin ankamen, waren die Hop-on-Hop-off Busse alle heillos überfüllt, sprich zuviele Menschen für zu wenig Busse. Wir sind ausgestiegen und waren dann froh einen Platz in einem anderen Bus zu bekommen, da außer uns an den ersten Haltestellen niemand ausstieg. Die Busfahrer waren alle sehr freundlich und zuvorkommend, haben viel erklärt und versucht alle Reisenden unterzubringen. if on a cruise ship you can pick up the bus with your voucher near the ship. We paid the shuttle bus to get to the hop on hop off tour starting point in city center. also I believe the senior rate was the same as Viator, so no savings, The Hop on Bus was a great way to see the city. Narration was good and there were plenty of stops. There was not much to hop off for in Darwin. Since we had never been there, it was a good choice. See all the famous sights including Opera House, Bondi Beach etc etc with full commentary.